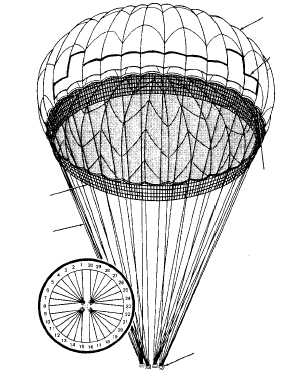 The MC1-1B maneuverable parachute assembly is used primarily for a premeditated jump when a precision landing in a small target area is necessary. The basic canopy is the same as the T-10B assembly, except that there are orifices or cut-out areas in 11 of the 30 gores, creating a gliding type descent. The canopy has two control lines, each extending from an outboard orifice to toggles which may be manipulated in such a way as to make 360° turns. It has a 3 3/4inch mesh anti-inversion net attached to the skirt of the canopy that extends 18- inches below the canopy shirt. When packed for service, the complete assembly weighs approximately 29-lbs (13kg), and has a nominal diameter of 35 feet (10.7m) and a projected or inflated diameter of 24.5 feet (7.5m). All material colors are U.S. Army Foliage Green #504.